Make sure your apps take advantage of the great new features in OS X Mountain Lion when the world's most advanced operating system ships to millions of customers worldwide. Download OS X Mountain Lion GM seed and Xcode 4.4 GM seed, now available on the Mac Dev Center. Build your apps with these latest seeds, then test and submit for review. You can also submit iOS apps that take advantage of the new cross-platform Game Center Groups, so they'll be available when OS X Mountain Lion ships. OS X Mountain Lion is only available to registered developers presently. The final version will be available to customers through the Mac App Store later in July. Apple will be pricing the release at $19.99. 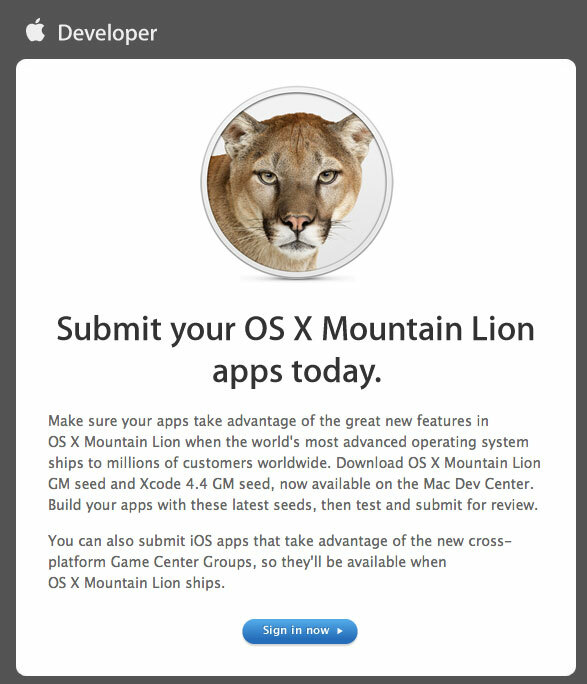 For context, when they did this for Lion (https://www.macrumors.com/2011/07/11/apple-asks-developers-for-os-x-lion-mac-app-store-submissions/), they shipped it 9 days later (https://www.macrumors.com/2011/07/20/apple-launches-os-x-lion-via-mac-app-store/). EDIT: See Peace's post (https://forums.macrumors.com/showpost.php?p=15216492&postcount=12) as well. It's looking like sometime between the 18th and 24th, based on a previous sample size of one. I hope with ML that more and more developers submit more apps. The Mac App Store isn't the most impressive thing on the planet, mainly because most devs are focusing on the iOS platform. Make more apps for the Mac!!! Apple, focus on the features, not the suing. Yes! Because it's the same people that doing the suing and the product development! The price point is pretty impressive. how does that relate to apple accepting ML apps in the app store?